Madrid-Barajas airport belongs to the Public Business Entity AENA, Aeropuertos Españoles y Navegación Aérea. It is located in the north-east of Madrid, Barajas district, only 12 km from Madrid city centre. The airport changed its name after 83 years of use to Madrid-Barajas by Adolfo Suárez Madrid-Barajas, a tribute to a former Spanish president who died in 2014. Contact phones: (+34) 902 404 704 / (+34) 91 321 10 00. AENA Airport Marketing and Airline Relations Dept. Users of airport facilities and services are obliged to pay a series of taxes in accordance with current legislation. There is a lost and found office in Terminal T4 and it is located on ground floor, arrivals Hall. From 7h to 22h . If you have forget something inside the aircraft you should contact your airline, or you can also contact with its baggage handling company. Telephones: 913 936 710 / 913 936 523. Telephones: 913 936 516 / 913 936 594. The airport has the code IATA MAD and ICAO LEMD. The airport disposes of four passenger terminals, one Executive terminal for executive and business aviation, one Cargo area, and two main hangar areas, on one side there is the Old Industrial Area, between terminals T3 and T4, and on the other side the Industrial Area La Muñoza. Adolfo Suárez Madrid-Barajas is the first airport in Spain, regarding passenger traffic, transport of goods and operations. It occupies the 5th position in the ranking of European airports based on the Eurostat agency data since year 2014, and is the fifteenth in the world by passenger traffic, according to Airports Council International (ACI) agency statistics since year 2015. 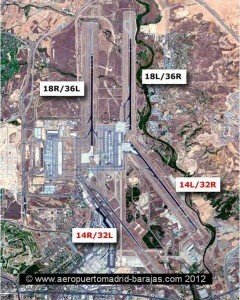 Madrid-Barajas counts on four parallel runways, two to two parallel: the 18L/36R - 18R/36L and the 14L/32R – 14R/32L. Its nomination was modified in 2012 adapting to the changes of the gradual movement of the magnetic North in relation to the geographic North. There is a runway more, the first one to be built, but only used as parking lot. 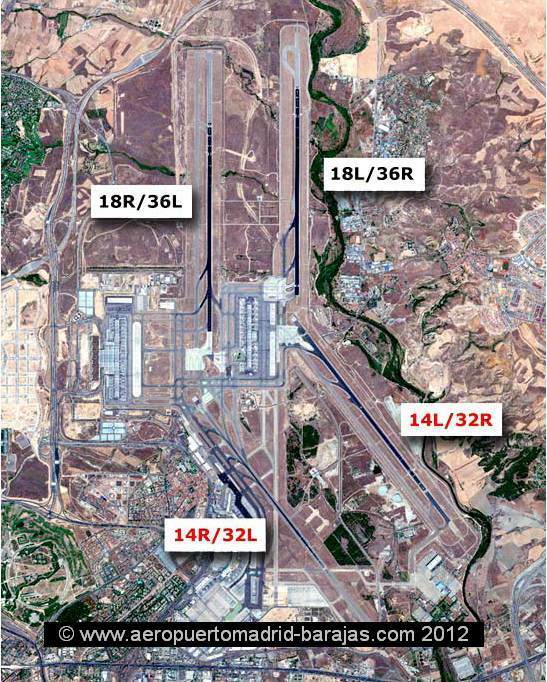 Ambitious expansion reforms at terminals T4 and T4S of the Madrid-Barajas Airport, started in 2012. At the boarding areas of terminals T4 and T4S, passengers will enjoy distinguished shopping in high-quality brand name stores, with attractive fashion garments and luxury accessories. This way, the airport will be upgraded economically, granting it a considerable status among the best European Airports. The MAD Fashion Hub consists of a remarkable space of over 900 m2 dedicated to high class designer-brand fashion, shoes, custom jewelry, exclusive jewelry, perfumes, cosmetics and accessories. If you are interested in promoting your company or product in this web, please contact us at: web@aeropuertomadrid-barajas.com. Train connections, metro links and AVE high-speed train connections from/to Madrid airport. Information about taxi stands and tariffs at Madrid airport.